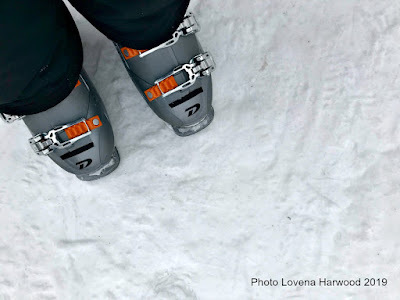 These aren't ice climbing boots! The folks at the Rental Shop were super nice and friendly, and made the entire process of getting my gear very easy. I took a shuttle from the Rental Shop to the South Peak Learning Area. From there I met Steve and he helped me adjust my ski boots so they fit properly. My lessons consisted of learning the basics every beginner skier learns. It was daunting at first, but when I finally got onto the skis and started moving around, it felt familiar. It felt like I was ice skating again. But just a tad bit annoying because of the awkwardness of the skis. Another bucket list item checked off! Even though I'll be 60 years old this July, that's never too old to learn to ski!